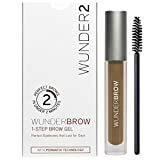 Wunderbrow contains an exclusive blend of hair-like fibers, combined with specifically treated pigments designed to fasten onto skin and hair. This Hair Fiber Complex is then fused into our PermaFix Gel to create a flexible matrix, locking the natural color and hairs onto our brows. The results are natural looking, perfectly shaped eyebrows that last for days. Traditional brow pencils, powders can be hard to apply, have multiple steps, can lock unnatural and don’t stay in place or last throughout the day. Some women are so desperate to brows they go to the extreme of “eyebrow tattooing.” This process certainly lasts but often looks unnatural, is painful and expensive. WUNDERBROW is a new solution which allows women to easily fill, define and shape their brows with natural looking color that lasts until they decide to take it off. WUNDERBROW gives the convenience of the perfect brow, at home, and in one easy step. Permafix Technology locks WUNDERBROW color pigments and fibers to the skin and brows without flaking, fading or smudging.